Toronto, April 12: The UK has not yet left the European Union and the way things are going for British PM Theresa May it does not look likely that her Brexit deal is any closer to being passed in the Parliament. The drama over Brexit has led EU country leaders to giving May an extended Brexit deadline of until October 31. 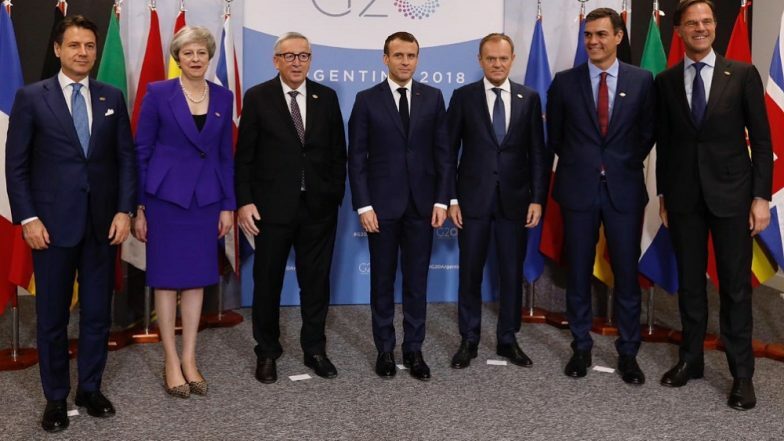 European Council President Donald Tusk said along with the extension being given to the UK he had a message for his "British friends", which was "please do not waste this time". The extension was granted just two days before the UK was to crash out of the EU without a deal. After the extension deal, the British prime minister wrote on Twitter, "The choices we now face are stark and the timetable is clear. So we must now press on at pace with our efforts to reach a consensus on a deal that is in the national interest." The extension deal in some ways further complicates matters for the UK as it now explicitly states that if UK does not want to crash out of the EU and also does not want to leave before June 1 then it must hold elections for the European Parliament. But if May’s government refuses to conduct the EU elections then the UK will have to leave the EU by June 1 – despite British MPs passing a bill in the parliament that has ruled out leaving the EU without a deal. That puts British MPs and Theresa May at another impasse. Meanwhile, Theresa May’s inability to garner majority vote for her Brexit Bill despite three attempts has many saying that she might be asked to resign as prime minister in the coming weeks. As if Brexit was not complicated enough.